How Much Do Americans Spend On Food? The medium household income in the US was $57,616 in September 2016. Half of households had income above that, half below. That’s income for a family, not one person. It’s middle America: not poor, not rich. It varies by geographic area and by race but it’s a good workable number. Let’s work with it. The share of income spent on total food began to flatten in 2000, as inflation-adjusted incomes for many Americans have stagnated or fallen over the last decade or so. 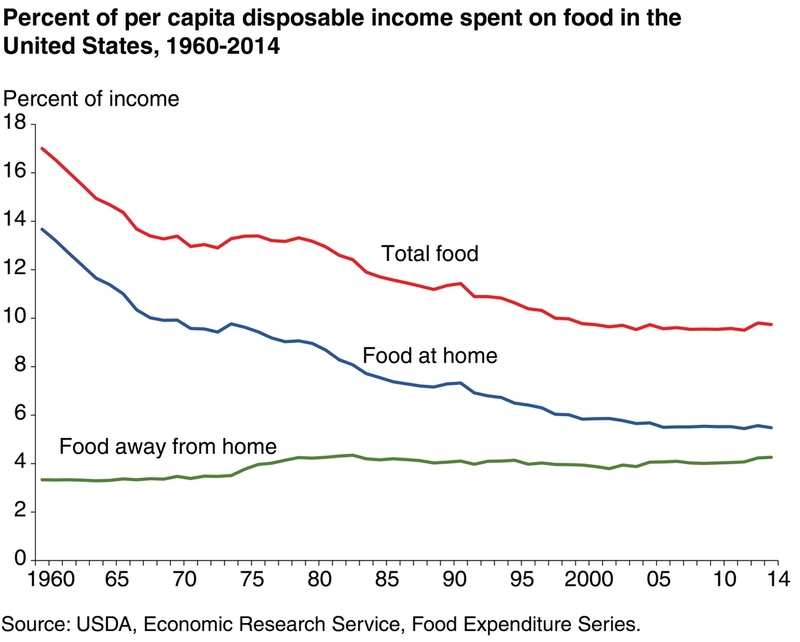 In 2014, Americans spent 5.5 percent of their disposable personal incomes on food at home and 4.3 percent on food away from home. Americans earning a medium income spend about $5,646/year, or $470/month, or $118/week on food. If there are 21 meals in a week, that’s about $5.62 per meal for the household. Of course, you can play with those meal numbers. Still, that’s the ballpark. That is middle America. How do the new meal kit delivery services compare? One of the services, Blue Apron, charges $69.92 for just 2 meals for a family of 4. That’s about $35/meal. Compare that to the $5.62/meal I just calculated. Another, Purple Carrot, charges $74 for 2 meals for a family of 4. (Purple Carrot was the business Mark Bittman left his job as a New York Times columnist to join. At the time he said it was “aimed for upper middle class families.” He was correct. When you hear or read about these services, know that they are for the privileged, not for the “masses” as Civil Eats claimed. This entry was posted in Uncategorized on November 11, 2016 by Bix. This is one reason why Trump was elected. Politicians have lost touch with how most Americans live. So has the media. Even in my own profession I have witnessed a creeping elitism. You’ve seen me blog about it. Just yesterday I saw a food activism outlet, the media right?, say everyone, every. one. should buy their food directly from a farmer. At a farmers market or CSA or if they *have* to buy at a grocery store make sure to ask who the farmer was and only buy from local farmers. So, local oats? local coffee? local oranges? Give me a break. I saw an RD ridicule another RD because she came to the defense of 100% fruit juice. He said we should only eat whole fruit. The elderly who already have a problem with thirst sensation and dehydration, who suffer swallowing difficulties, people who no longer drive and do less cooking because of encroaching disabilities, should somehow get to a local farmer and lug home bags of grapefruits and oranges and skip the juice? All of this is out of touch with how people live. No wonder the populist right (Trump) and the populist left (Sanders) got so much support in this election. What are Americans spending more on if they’re spending less on food? Healthcare. I saw an ad for Blue Apron and thought “What a scam!” We spend ~$50 weekly on food alone. That doesn’t include household items like paper towels, nor pet food. I grew a lot of tomatoes and some herbs and greens. Those have either been dried or frozen. Have gotten a few ripe figs from a plant I bought about 7 years ago–it’s a very late producer–but it doesn’t cost me anything to have it growing in the yard. There are still a lot of green figs on it. We also eat dandelion greens & such from our tiny yard (~1/10th acre). RD is Registered Dietitian. I’m sorry. I should have said that. The thing is … that $5.62 is for a household, not for 1 person. I mean, it could be one person, or it could be 10 people. Also … it includes eating out. There isn’t other money devoted to restaurant eating. I’d say most of our meals fit easily (for two) within the 5.62 parameter, usually with enough left over for a second night for two. And we eat at a restaurant maybe once a year. Pasta and beans go a long way! Angelhair gives you the most bang for your buck! Did you ever read “The Tightwad Gazette” (3 vols. available at the library) by Amy Dacyczyn? Very inspirational re frugality, even as far as dumpster diving (which I did in grad school).